If you need help planning a menu to help you save money by eating at home more and eating out less, you have found the right place. Here’s a good post to help you get started on menu planning. If you want to see how I menu plan take a look at this post. To get started on Monthly Menu Planning, try this two part series, Part 1 and Part 2. 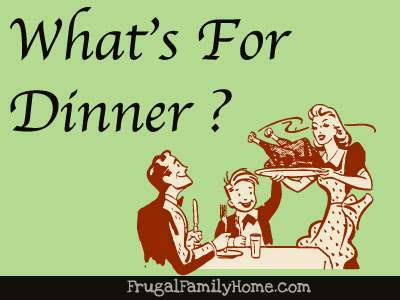 Here’s an article on How to Figure your Price Per Meal. If you need some ideas on how to keep your menu plan eat to prepare, try the Simple Meals post to show you how. Also check out the $100 Grocery Shopping Challenge post to see how I feed our family of 4, even with milk allergies for under $100 a week.